In December 2009, David Miscavige stood before 7,000 Scientologists packed into Los Angeles’ Shrine Auditorium. They had assembled to celebrate the previous decade of expansion for Scientology and to usher in another decade of growth. 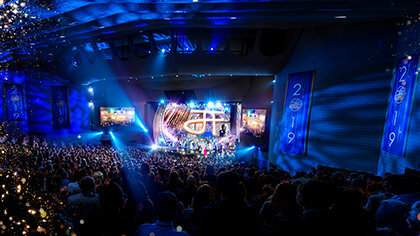 On that night, Mr. Miscavige announced a decade of milestone accomplishments, as well as the achievement of a historic first for the religion—completion of the 25-year program to recover, verify and restore the Scripture of the Scientology religion. The quarter-century endeavor that involved two million man-hours to recover and make fully accessible all written and spoken words of L. Ron Hubbard constituted “the ultimate guarantee for the permanency of Scientology itself,” said Mr. Miscavige. L. Ron Hubbard initiated the program in 1984 to provide Scientologists the full legacy of his 50 years of research and discovery into the mind, spirit and life. With the inauguration of the Golden Age of Knowledge in 2005 also came the release of the Congress Lectures. These lectures were L. Ron Hubbard’s special events containing his announcements of each new milestone breakthrough in the research and development of Dianetics and Scientology. Then in 2007, Mr. Miscavige presented the fully restored Basics, Mr. Hubbard’s 18 books and 280 lectures that are the core of the Scientology religion. And in the final days of 2009, Mr. Miscavige announced the historic accomplishment crowning the Golden Age of Knowledge: the release in English of L. Ron Hubbard’s Advanced Clinical Course Lectures (ACCs), in their entirety. These materials include more than 1,000 lectures and 500 written issues chronicling the day-to-day record of L. Ron Hubbard’s path of discovery in Dianetics and Scientology. While Mr. Hubbard announced each new milestone to Scientologists as a whole at his Congresses, in the Advanced Clinical Courses and accompanying Professional Course Lectures all details of application were presented to auditors. 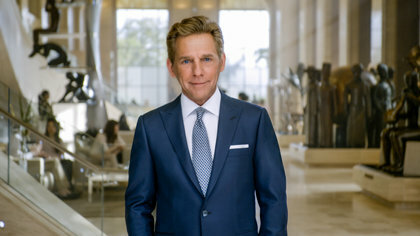 The quarter-century endeavor that involved two million man-hours to recover and make fully accessible all written and spoken words of L. Ron Hubbard constituted “the ultimate guarantee for the permanency of Scientology itself,” said David Miscavige. Given their significance, it was always L. Ron Hubbard’s dream that one day the resources and technology would exist to make these lectures available to all—that day had arrived. Mr. Miscavige likewise announced the release of courses for every Congress, Professional Course and Advanced Clinical Course lecture series, greatly facilitating the chronological and methodical study of these vast bodies of Scripture. Restoration of all L. Ron Hubbard lectures additionally made possible the selection of 52 Classic Lectures—15 of which had never before been released. These 52 Classics were designed for Scientologists, with half of them requiring no previous education in Scientology and specifically designated for people new to the subject. The lectures cover subjects ranging from marriage to leadership to Man’s spiritual nature. Quite in addition, all the basic books of Dianetics and Scientology were also produced and released in audiobook format. These audiobooks represent all-inclusive renditions of the original works, and were translated into 15 languages. Finally, two notable public lectures by Mr. Hubbard were also released: The Golden Dawn: Phoenix Evening Lectures and The Lindsey Theatre Lectures: London Afternoon Series. Originally delivered to the general public to introduce them to Dianetics and Scientology, these lectures were recovered, restored and made available in 17 languages. With the inclusion of the lectures, all materials of the Scientology religion, containing the answers that humankind has sought for centuries, became available in multiple languages, many formats, and were forever preserved for the benefit of all. 196 L. Ron Hubbard lectures are released in 15 languages simultaneously across the world—the largest single audio release in history. Two Guinness World Records are awarded to L. Ron Hubbard: Most Published Author (1,084 titles) and Most Translated Author (71 languages). 1.8 million pages of L. Ron Hubbard’s writings are translated since 2004, five times the total for the prior 50 years (359,459 translated pages). 14,211 hours of translation of L. Ron Hubbard lectures are recorded between 2005–2008. March 13th becomes the biggest single publishing event in history. Nine L. Ron Hubbard Beginning Books are released simultaneously in 50 languages (450 titles). 70 million L. Ron Hubbard books and lectures are sold between 2007–2009, more than in the first 50 years of Dianetics and Scientology. More than three million L. Ron Hubbard books on Dianetics and Scientology are placed in over 125,000 libraries. A third Guinness World Record goes to L. Ron Hubbard, for Most Audiobook Titles on Earth (185). December 27: A historic accomplishment crowns the Golden Age of Knowledge—the release in English of L. Ron Hubbard's Advanced Clinical Course Lectures, more than 1,000 lectures and 750 issues explaining his path of discovery in Dianetics and Scientology. For the first time, all of L. Ron Hubbard's complete chronology of materials are available to everyone, everywhere.